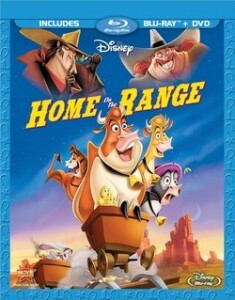 “Home on the Range” is coming to Disney Blu-ray for the first time on Tuesday, July 3. The cast includes Roseanne Barr, G.W. Bailey, Steve Buscemi, Judi Dench, and more. Official synopsis: When a greedy outlaw schemes to take possession of “Patch Of Heaven” dairy farm, three determined cows, a karate-kicking stallion named Buck, and a colorful corral of critters join forces to save their home. The stakes are sky high as this unlikely animal alliance risks their hides and match wits with a mysterious band of bad guys. Also coming to Blu-ray on July 3 is the 10th Anniversary Edition of “Treasure Planet,” starring Joseph Gordon-Levitt, Emma Thompson, David Hyde Pierce, Martin Short, and more. Official synopsis: From the directors of Disneyâ€™s Aladdin and The Little Mermaid comes a classic story of courage, friendship, and self-discovery. A secret map inspires a thrilling treasure hunt across the universe as young Jim Hawkins and his hilarious cosmic crew, headed by the daring Captain Amelia, set off in search of their destiny. Aboard a glittering space galleon, Jim meets the ship’s cyborg cook, John Silver, who teaches him the value of friendship and the power of dreams. Jim soon teams up with his crazy new robot pal, B.E.N., and the shape-shifting Morph to discover a treasure greater than he ever imagined. From the creators of Ice Age and Rio comes EPIC, an adventure deep in a magical forest, in theaters May 24, 2013. An incredibly unique short film that’s probably unlike anything you’ve seen before. Watch this.